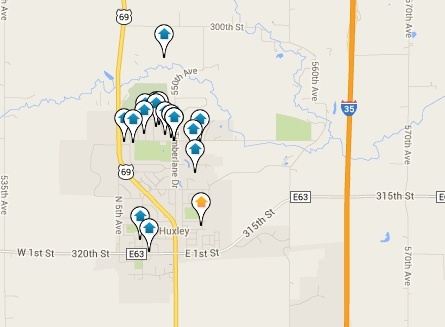 Huxley Iowa Real Estate is a hot commodity these days with the town's close proximity to Ames, IA and Des Moines, IA. Being close to both locations provides households with options for a quick commute either way for work, entertainment, and activities. Huxley is a small town of approximately 2,400 residents with just under 1,000 housing units. It offers tremendous amenities for familes in its large community recreation center, six city parks, and more than 1,000 acres of green space. This community is centrally located between Ames and the northern suburbs of Des Moines, and is included in the Ballard Community School District. Well maintained 3BR, 1bath home in excellent location. Deck overlooks large fenced yard with storage shed. Hardwood floors. 52 Gross acres and 42.89 net. 45 acres are being farmed by a tenant who will have use of the property until the 2019 crop season is over.